At the invitation of Abdul Fatah Al-Sisi, President of the Arab Republic of Egypt, Minister of Education Chen Baosheng will travel to Egypt to attend the World Youth Forum from November 2 to 7 as the Special Envoy of President Xi Jinping. Q: Russian Prime Minister Dmitry Medvedev is now in China. When giving an interview to People's Daily yesterday, he said the current Russia-China relationship is at its all-time high. The 19th National Congress of the Communist Party of China (CPC) formulated the new long-term plan and adopted a series of resolutions of strategic significance, which made the Russia-China relations embark on a new journey. What's you comment on this? A: We have noted that Russia made a series of positive remarks on the 19th CPC National Congress and China-Russia relations in recent days. As we all know, shortly after the successful conclusion of the 19th CPC National Congress, President Vladimir Putin talked to President Xi Jinping by phone on October 26 to express his warm congratulation on the successful conclusion of the 19th CPC National Congress and President Xi Jinping's reelection as the General Secretary of the CPC Central Committee. He said that it is very important that the 19th CPC National Congress established Xi Jinping Thought on Socialism with Chinese Characteristics for a New Era and he sincerely wished that President Xi will lead the CPC, the largest political party in the world, to greater achievements continuously. President Putin also pointed out that, the Russia-China relations serve as a model for the harmonious coexistence of modern major countries and that he is willing to maintain close contact with President Xi to enhance the cooperation in various fields between the two countries and closely communicate and coordinate on major international and regional issues. These days, Prime Minister Dmitry Medvedev is paying an official visit to China at the invitation of Premier Li Keqiang. As the first foreign leader that came to China after the 19th CPC National Congress, Prime Minister Dmitry Medvedev's visit fully testifies to the closeness and high level of China-Russia Comprehensive Strategic Partnership of Coordination. This morning, Premier Li Keqiang and Prime Minister Dmitry Medvedev held the Regular Meeting between Chinese Premier and Russian Prime Minister and jointly attended the closing ceremony of the China-Russia Media Exchange Year. This afternoon, President Xi Jinping and Chairman of the Standing Committee of National People's Congress Zhang Dejiang would meet with Prime Minister Dmitry Medvedev respectively. As you said in your question, when giving an exclusive interview to People's Daily, Prime Minister Dmitry Medvedev said that the 19th CPC National Congress would set the China-Russia relations on a new journey. Indeed, both China and Russia are the permanent member of the UN Security Council as well as major countries with important responsibility for world peace and security. The report of the 19th CPC National Congress points out that China will advance a new type of international relations featuring mutual respect, fairness and justice and win-win cooperation and build a community of shared future for mankind, which will bring a broader prospect for China-Russia Comprehensive Strategic Partnership of Coordination. At present, the China-Russia relationship is at its best of times. We stand ready to continuously work with Russia to bolster mutual political trust, deepen cooperation, further enhance China-Russia Comprehensive Strategic Partnership of Coordination so that the high-level development of China-Russia relations will bring benefits to the two peoples and make greater achievements to peace and security. Q: Could you please offer more details about the deals that were signed this morning during the meeting between Chinese and Russian Prime Ministers? A: This morning, Premier Li Keqiang and Prime Minister Dmitry Medvedev co-chaired the 22nd Regular Meeting between Chinese Premier and Russian Prime Minister, and the press release will soon be issued. During this meeting, the two Prime Ministers had an exchange of indepth views and reached extensive consensus on how to deepen China-Russia Comprehensive Strategic Partnership of Coordination, promote across-the-board practical cooperation and more deeply tap into the strength and cooperation potential of the two countries. According to my information at hand, Premier Li Keqiang and Prime Minister Dmitry Medvedev signed the Joint Communique of the 22nd Regular Meeting between Chinese Premier and Russian Prime Minister, and witnessed the signing of nearly 20 bilateral cooperation documents in such fields as investment, energy, sub-national cooperation, cultural and people-to-people exchange, agriculture, customs, quality inspection, aerospace and finance. Q: First, US police have arrested a man suspected of killing a Chinese student of the Utah University. Do you have a comment on that case? Second, according to a US official, the US is in quiet diplomatic talks with the DPRK. Do you have a comment on those talks? Can you tell us whether China has played any role in this process? A: As to your first question, on October 30 local time, a Chinese student at the University of Utah was shot dead in a fatal robbery near the campus. At present, the suspect has been arrested by police. After learning about this news, the Chinese Embassy in the US immediately contacted the police for information and urged them to crack the case as soon as possible. 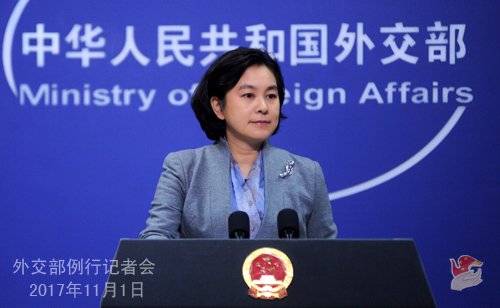 The Chinese Foreign Ministry and Embassy in the US will continue to closely follow the development of the case and provide necessary assistance to the family for properly handling the aftermath. The Chinese Embassy in the US has issued a security alert on the recently prominent social security problems, including frequent robbery and theft, in certain parts of the US. The Embassy reminds Chinese nationals in the US to raise security and self-protection awareness, stay vigilant against suspicious persons nearby, avoid going out alone at night and keep calm and call the 911 in case of danger. With respect to your second question, China's stance on the Korean Peninsula issue is unequivocal. We have made unremitting effort to promote the peaceful settlement of the Korean Peninsula nuclear issue through diplomatic means. We welcome any contact and dialogue between the DPRK and the US. We encourage the two sides into contact and dialogue and hope that this will help enhance the mutual understanding and trust between the two sides and bring the Korean Peninsula nuclear issue back to the track of peaceful settlement through such diplomatic means as dialogue and negotiation. Q: As China and the ROK issued the readout about their communication on bilateral relations and other issues, will their economic relations return to the normal quickly? A: As I said yesterday, properly handling the THAAD issue and removing the obstacles to China-ROK relations are the shared aspiration of the two countries and conform to the common interests of the two sides, we hope the two sides can jointly work to bring the bilateral relations back to the track of normal development at an early date. China attaches importance to the exchange and cooperation in various fields between the two countries and hopes to work with the ROK to create enabling conditions for such exchange and cooperation. Q: According to reports, 8 people were killed and 11 injured in the truck attack and shooting in Manhattan, New York, yesterday afternoon local time, and the perpetrator was arrested. New York City Mayor Bill de Blasio said it was a terrorist attack. What's your comment on that? Is any Chinese national injured? A: We condemn this incident, mourn for the victims and express condolences to those injured and the bereaved families. We have noted that the mayor of New York city has branded the incident as a terrorist attack. Terrorism is the common enemy of mankind. China opposes all forms of terrorism and calls for stronger counter-terrorism cooperation among the international community. 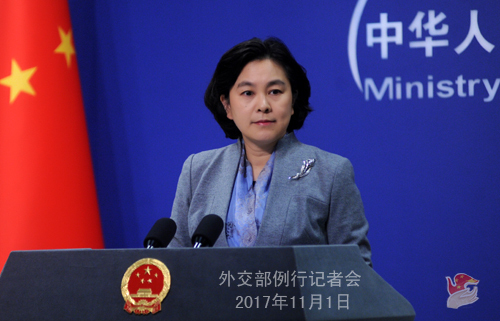 The Chinese Foreign Ministry and Consulate General in New York attaches great importance to the incident. The Chinese Consulate General in New York immediately launched the emergency mechanism and tried to learn and verify the information by contacting the relevant US department. We have not received any report on the casualties of Chinese nationals by far. We will continue to closely follow the situation and provide assistance to Chinese nationals that may be involved.